Recognition of hospitals in The Joint Commission Top Performer is based on overall Accountability Composite of 95 percent score or better. General, children’s, psychiatric, surgical and cardiac specialty, and critical access hospitals. Hospitals and critical access hospitals must have submitted at least 12 calendar months of data on at least one core measure set. Seasonal measures (influenza immunization) will be included if two calendar quarters of data exist for the calendar year under consideration. The sum of all the denominator cases for all accountability measures submitted must be ≥ 30. Minimum 6 core measure set selections for 2015. Patients with health conditions or factors that influence the effectiveness of treatments, or whether or not a provider orders a particular treatment. Patient’s refusal to treatment or not follow the instructions of plan of care. Two ratio measures from the inpatient psychiatric services set are excluded from the overall accountability composite. If all the reported accountability measures have denominators less than 30, then the organization is not eligible to be listed. The overall 2014 composite calculation corresponds to the fourth quarter of previous year data on the ORYX Performance Measure Report (PMR); the rates are not rounded up. All ORYX data are considered final as of the 4Q transmission deadline in April and consistent with eCQM specifications poste don CMS website; no retransmission data received after April 30 are applied to the program. 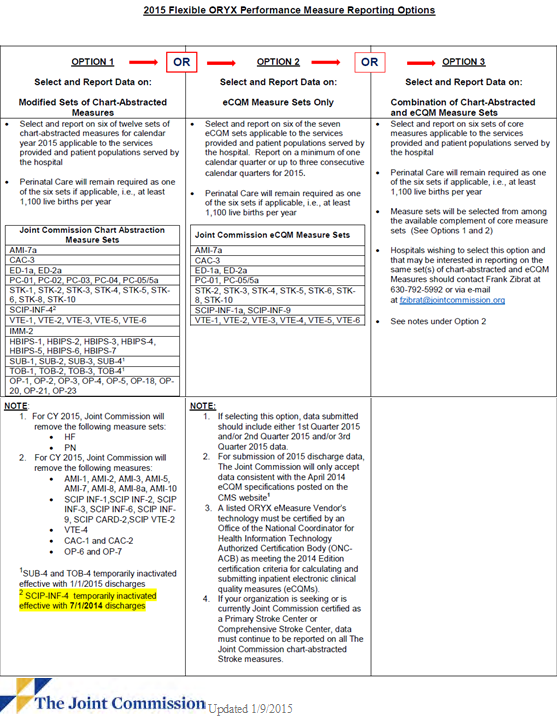 A listed ORYX eMeasure Vendor’s technology must be certified by an Office of the National Coordinator for Health Information Technology Authorized Certification Body (ONC-ACB) as meeting the 2014 Edition certification criteria for calculating and submitting inpatient electronic clinical quality measures (eCQMs). If your organization is seeking or is currently Joint Commission certified as a Primary Stroke Center or Comprehensive Stroke Center, data must continue to be reported on all The Joint Commission chart-abstracted Stroke measures. Recognition as a Top Performer is determined using a three-step process. To be recognized as a Top Performer for 2015 Recognition (being applied to 2014 data), a hospital must successfully meet all of the criteria in the three steps outlined below. 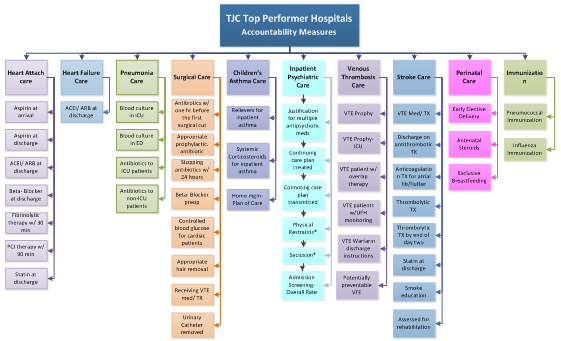 Step 2 – Each and Every Accountability Measure ≥ 95%: A hospital must achieve a rate ≥ 95% on each and every applicable reported accountability measure where there are at least 30 denominator cases(based on the rate obtained from the combined 12 calendar months of data. Step 3. Core Measure Set Designation: The calculated composite rate for all accountability measures reported within a particular core measure set must be ≥ 95%. A core measure set composite rate ≥ 95% (based on the rate obtained from the combined 12 calendar months of data). All applicable individual accountability measures with a rate that is ≥ 95% based on the rate obtained from the combined 12 calendar months of data. Please refer to Top Performer on Joint Commission Key Quality Measures Program for 2015 Recognition for Step 1- 3 algorithms. Recognition in The Joint Commission Top Performer is based on overall Accountability Composite of 95% score or better derived from a total of 44 Accountability Measures from 10 measure sets: measures from 10 sets (heart attack care, heart failure care, pneumonia care, surgical care, children’s asthma care, inpatient psychiatric services, venous thromboembolism (VTE) care, stroke care, immunization and perinatal care). Two ratio measures from the inpatient psychiatric services set are not included in the overall accountability composite. The two measures in the immunization set were formerly a part of the pneumonia care set. There is no heart failure care measure set composite because a measure set composite must have at least two measures and the heart failure set is comprised of only one accountability measure. The composites for each year are calculated on measures active for the year, which can change from year to year. A 95% score means a hospital provided an evidence-based practice 95 times out of every 100 opportunities to provide the practice. Criteria for accountability process measures areas: research, proximity, Accuracy and Adverse Effects. Research: Strong scientific evidence demonstrates that performing the evidence-based care process improves health outcomes (either directly or by reducing risk of adverse outcomes). Proximity: Performing the care process is closely connected to the patient outcome; there are relatively few clinical processes that occur after the one that is measured and before the improved outcome occurs. Accuracy: The measure accurately assesses whether or not the care process has actually been provided. That is, the measure should be capable of indicating whether the process has been delivered with sufficient effectiveness to make improved outcomes likely. Adverse Effects: Implementing the measure has little or no chance of inducing unintended adverse consequences. This report includes a composite for accountability measures: the sum of all the numerator counts for accountability process measures across all measure sets divided by the sum of all the denominator counts from across the same accountability measures. In addition, a composite measure for a measure set is calculated by adding or “rolling up” the number of times recommended care was provided over all the process measures in the given measure set and dividing this sum by the total number of opportunities for providing this recommended care, determined by summing up all of the process measure populations for this same set of measures. The composite measure shows the percentage of the time that recommended care was provided. Effective with January 1, 2015 discharges accredited hospitals have the flexibility of meeting their ORYX measure reporting requirements through one of three options. Detailed information regarding each of the available reporting options can be found in the “2015 Flexible ORYX Performance Measure Reporting Options”. Option 1: Vendor submission of quarterly data on a minimum of six sets of chart-abstracted measures. Option 2: Vendor submission of quarterly data on a minimum of six sets of electronic clinical quality measures (eCQMs). Option 3: Vendor submission of quarterly data on a minimum of six sets of measures using a combination of chart-abstracted measure sets and electronic clinical quality measures (eCQM) measure sets. HBIPS-2a Process measure reported as a ratio and will not be included in the Joint Commission’s calculation of composite rates. HBIPS-3a Process measure reported as a ratio and will not be included in the Joint Commission’s calculation of composite rates. IMM-1a Measure has been temporarily inactivated effective with 1/1/2014 discharges. TOB-4 Measure has been temporarily inactivated effective with 1/1/2015 discharges and will not be included in the Joint Commission’s calculation of composite rates for 2014. SUB-4 Measure has been temporarily inactivated effective with 1/1/2015 discharges and will not be included in the Joint Commission’s calculation of composite rates for 2014. SCIP-Inf-4 has been temporarily inactivated effective with 7/1/2014 discharges and will not be included in The Joint Commission’s calculation of composite rates for 2014. PC-05a Measure is being retired effective with 10/1/2015 discharges and will not be included in The Joint Commission’s calculation of composite rates for 2014.